Today is not the 10th of the month (not yet!) but this is a busy week for blog posts so I’m posting this one a few days early. 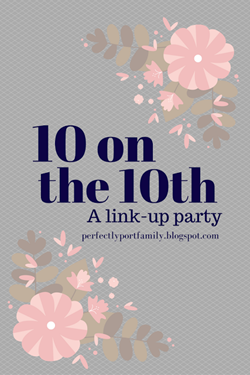 This month’s topic for 10 on the 10th with Perfectly Port is 10 Must Haves for Summer Vacation – and summer vacation is definitely on my mind! Make sure you read this one to the end because I have an awesome giveaway for one of my newest summer vacation must have items! Some of the following links may be affiliate links, which means that if you purchase an item after clicking on the link, I may receive a small commission. 1. Last summer when I went to Block Island, I forgot my sunglasses! Luckily my friend had two pairs with her! This year, I’m going to be very sure that my sunglasses (that I got from Cents of Style but aren’t currently available) are in my bag! 2. Speaking of bags, the reason I forgot my sunglasses was because they were in my regular every day bag, but when I travel I usually pack up my backpack and that time I took a tote bag and I forgot to switch them. I like to use my backpack as a personal item on the airplane (and I take a suitcase carry-on), but if I don’t want to carry my backpack around wherever we are on vacation, I try to pack a smaller bag in my suitcase as well. 3. Sunscreen is important for vacation, especially if you’re going to be outside a lot. If you’re not checking bags though, you either need to buy when you arrive or stock up on sample sized tubes! 4. I like to use BB (or CC) Cream on my face, because it not only gives me a light layer of makeup, but it usually also contains SPF. My current favorite is Garnier Skin Renew Miracle Skin Perfector BB Cream. 5. After a long day of sweating off your makeup, I recommend Burt’s Bees Facial Cleansing Towelettes for clean up. 6. I always have so many electronic items with me when I travel and I need to make sure I have the right chargers for them! Luckily, many of our electronics have USB cables, and I just got a double USB charger that will be helpful for charging more than one thing at once! I also make sure I have a backup charger with me on trips! 7. I tend to walk a lot when I’m traveling and it’s so important to have comfortable shoes – I say this from experience! For the summer, I love Teva Olowahu Flip Flops! 8. I would be devastated if I forgot to take my camera on vacation! 9. I always stick a few extra plastic bags in my luggage for dirty laundry, wet bathing suits, etc. They almost always come in handy. 10. Lastly, if you’re traveling to a beach or a hotel pool, you’ll need beach and pool wear. I don’t know about you, but I always hate when I want to walk back to my hotel room and my bathing suit is wet and I want to get dressed but I don’t want to put my clothes on over my suit because then they’ll get all wet…enter the LOLL. The LOLL is a poncho / towel that you can throw on over your bathing suit. They are quick drying. The back is longer than the front to protect your legs when sitting, and you can unzip the sides and lie on it as a towel. It also has an internal pocket with a hidden smaller pocket inside! I am giving away one of these awesome LOLL towel ponchos thanks to the lovely founder, Lara (LOLL stands for “Lots Of Love, Lara!”) Just use the form below to enter! If you love the LOLL and want to make a purchase, you can get 10% off with the code NIJ10 until May 31st! What are your summer vacation must-haves?